For those who want an outdoor adventure rich in majesty and fun, then you should set your sights on Topsail Hill State Park. 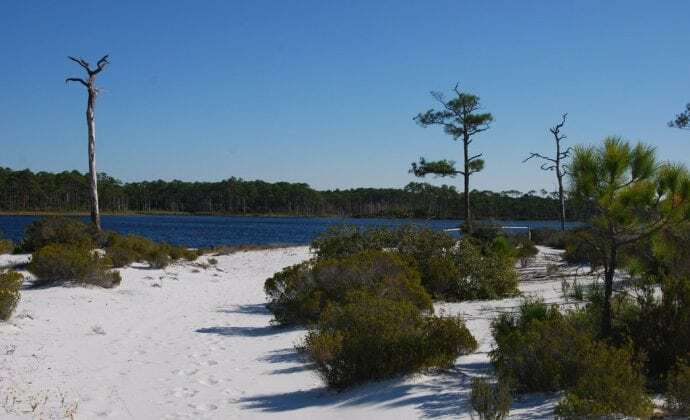 Located in Florida where the area history promotes outdoor activites and living, Topsail Hill State Park is an excellent choice for those looking to hike or do a bit of RV camping. Stretching over 3.2 miles, this area has not only white sand beaches, but they also hold sand dunes of up 25 feet tall. There are numerous places to pitch your tent or park your camper, so you can easily hop on into the state park and enjoy nature at its best. This article will go over some of the activities that you can enjoy when you choose to visit Topsail Hill State Park. Sunrise. Photo credit Dale Berlin on floridastateparks.org. These formations separate the Gulf of Mexico from the lakes. This is a rare occurrence where freshwater exists so close to salt water. These lakes are absolutely beautiful and contain quite a bit of wildlife. 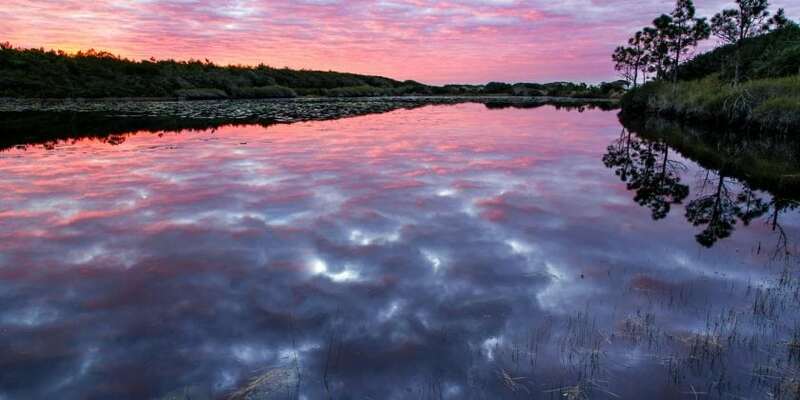 So, if you and your family enjoy observing nature in its natural state, then be sure to visit one or all three of the dune lakes to see if any of the nearby animals are there for a drink. The fish in these lakes are quite unique as they often have to transition between living in saltwater and freshwater. There are times when the dunes are breached, and the water from the Gulf of Mexico seeps into the lakes and vice versa. As such, the fish have to be able to adapt. For those who enjoy fishing, these lakes can provide you with quite a few interesting catches. The Topsail Hill State Park is jammed full of hiking trails for you to explore. While most tend to use a bike, there’s something to be said for the slower pace of traveling on foot. There are many deer trails and clearings that can be easily missed when zipping along the trail. However, there’s a lot of ground to cover, so if you want to make sure that you see it all, you may choose to either opt for a bike or spread your hike over a couple of days. Hiking is an excellent hobby that not only keeps you in shape, but it also provides an excellent avenue to admire and observe wildlife as well as plant life. The entire family can share in the adventure of hitting the trails and discovering the secrets that Topsail Hill State Park has to offer. One of the best features of this state park is the fact that they have 3.2 miles worth of beaches. These aren’t just any beaches either. The sand is made up of quartz brought in from the Appalachian mountains that have been ground down into fine, white sand. This beautiful shade of white makes the blue water even more gorgeous, and the sand is extremely soft on your feet. Whether you choose to walk or take the tram, you can easily enjoy stretches of beach where no one else is spending time. For those looking for a romantic, isolated patch of beach to call their own for a few hours or for a family looking to have some fun in the water, the beaches of Topsail Hill State Park are wonders all their own. Try your hand at snorkeling or maybe grab a boogie board and ride some of the waves. The sand itself is perfect for sculpting, and there’s nothing quite like soaking in the sun and relaxing after a long hike. As mentioned before, the dune lakes offer a perfect location for possible species viewing. The thick forests of Topsail Hill State Park also offer plenty of opportunities to look for certain species of animals. Bring the family along to learn a few things about the local wildlife and how you can ensure that such species last for years to come. Part of the reason outdoor activities are so important for the family is that not only does it keep everyone fit and healthy, but it also offers valuable lessons on responsibility and the impact a person has on the environment and wildlife that live within that environment. The camping at Topsail Hill is quite luxurious. 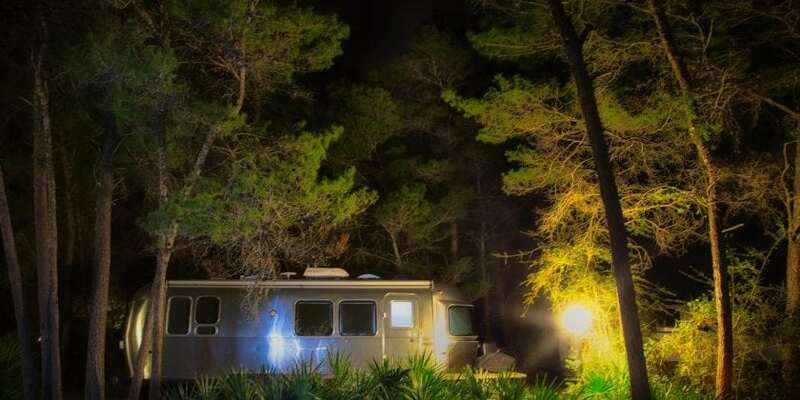 They have 156 RV sites with full hook-ups AND cable! There is a great pool to cool off after a long day at the beach and very nice heated/cooled bathrooms for showering. A concession store has snacks, firewood and camping supplies in case you forgot a necessity. Pets are welcome in the campground but must be well-behaved and kept on a 6′ leash. There are no pets allowed in the cabins or on the beach. For the family or couple that wants to do away with boring vacations, then you should consider visiting Topsail Hill State Park. There’s an adventure to be found for everyone to explore. For more information on the park, call 850.267.8330 or visit the Topsail Hill State Park page of floridastateparks.org. Reservations for campsites can be made at reserveamerica.com.